To help replenish sterile urban soils that do not get the opportunity for nutrient recycling. To help strengthen diseased trees. To aid the establishment of young trees. To provide nutrients where poor soil conditions exist. To provide nutrients for trees growing in adverse conditions (eg. parking lots, roadsides, etc.). To provide additional nutrition where trees are in competition for soil resources. For general maintenance to ensure good plant health. Tree fertilizing is performed using a truck mounted system with special equipment to pressure a liquid suspension of slow release fertilizer into the root absorption zone of the tree. This zone extends from the trunk to a few feet past the drip-line (outer extent of the branches). The residual quality of our fertilizer provides nutrient release for a two year period. This product also contains a complete package of secondary and micro nutrients complimented with Mycorrhizae beneficial fungi for health root development and tree growth. Some trees may have special needs that would require products such as chelated iron or soil acidifiers. Did you know that Fall and Spring are excellent times to have your trees and shrubs fertilized! Call now to arrange for a free inspection and proposal by one of our Certified Arborists. 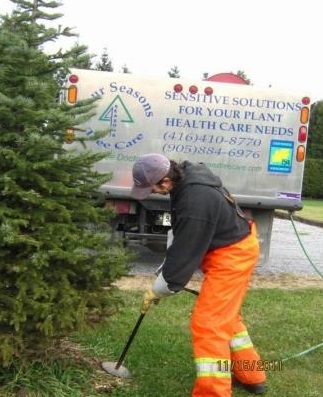 We provide tree fertilizing in Ajax, Aurora, Etobicoke, King City, Markham, Mississauga, Newmarket, North York, Pickering, Richmond Hill, Stouffville, Thornhill, Toronto and Vaughan.